My First Three Months on Zero Carb by Adam Valls | Eat Meat. Drink Water. 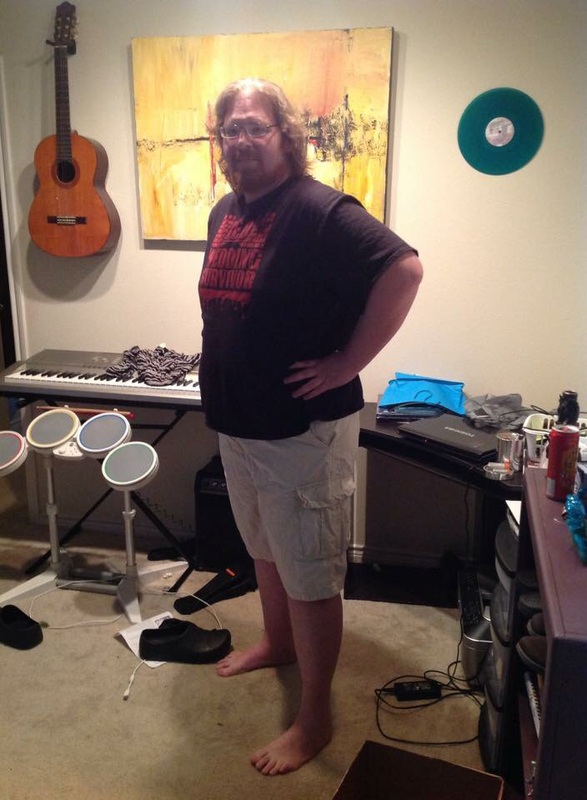 Adam today – April 2015 – after 3 months on Zero Carb. Except for a two year period where I was at a reasonably healthy weight, I’ve been fat for most of my adult life. In fact, I was probably classified as morbidly obese. I am now 38 years old, and have been a waiter for over 20 years. It’s what I love to do. I love interacting with people, and I treat it like my own business. However, as the excess weight has piled on over the last couple of years, it was becoming increasingly difficult to drag myself into such a energy-intensive and demanding workplace each day. It was literally destroying my body, but I had to work and so I persevered. On December 15, 2014, I was over 380 lbs. I went to a basketball game with my wife and her family. To my utter embarrassment, I could barely fit into the seat without bending the handles out. It was a truly demoralizing moment. A few days later, I had a life changing experience. I was sitting on the couch at around 9pm, eating something horrible. All of a sudden, I felt light headed. I stood up and found myself extremely dizzy. Everything around me seemed disjointed, distant and unreal. My heart rate shot through the roof, and I began to feel cold and clammy. I ran to the bedroom and sat on the floor in front of the fan and tried to control my breathing and not panic. For the whole rest of the night, I felt dizzy and out of it. I should have gone to the hospital, I know, but I didn’t. I was terrified to find out what was actually happening. So, I just laid down and went to bed instead. The next morning I woke up and felt more or less okay, though a tad bit exhausted. 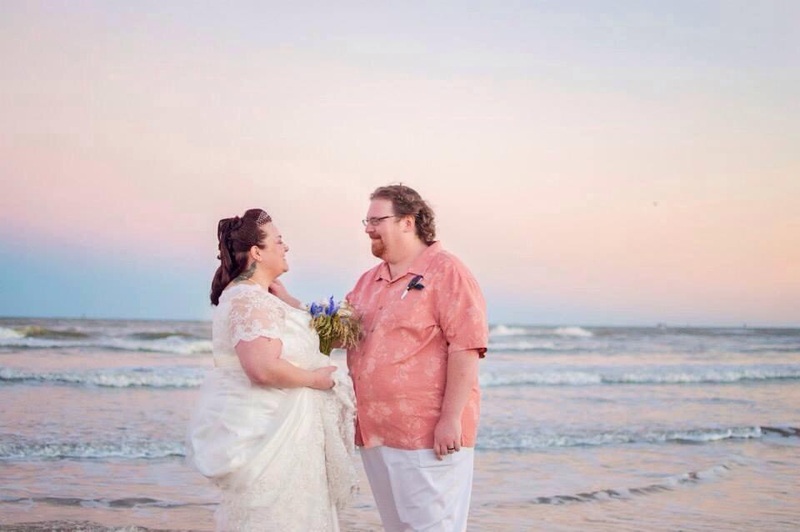 My wife and I had only been married 2 years and I was not ready to keel over when we were just starting our lives together. I knew I had to do something to change the course I was traveling if I wanted to be able to enjoy her company for many more years to come. Adam and his wife Eisha on their Wedding Day 2013. Like most others who have had struggled with their weight, I’ve tried pretty much every diet in the book: weight watchers, paleo/primal, DASH, this, that and everything else under the sun. In the days after my episode, I looked everywhere for something to help me lose weight and get healthy. I bought Keto Clarity by Jimmy Moore and read it in a day. I was excited to try this way of eating, and I even corresponded with Jimmy via email for a week or so after starting a LCHF diet. It worked well for me. I think I dropped 25 pounds in the first week. I was overjoyed! Around that same time, I started hanging out on the keto reddit site. After reading a lot of posts there from successful ketoers, I saw someone mention Zero Carb. I learned there was a Zero Carb reddit page, so I went there to check it out. It was there that I started reading Ash Simmonds’ posts. This, in turn, led me to the Zeroing in on Health Facebook group page. I dove in to the site and spent a couple of days devouring all the posts there and instantly wanted to join. I sent a request to the founder Charles Washington and felt like a kid at Christmas whilst waiting to be approved. On Christmas Eve, I ate my first all-meat meal. I’ve been ZC for just over three months now. The transition was very difficult, as I kicked the carb and sugar addiction. I was tired, sore, cranky, and having serious bowel issues (mostly diarrhea). But I stuck with it, and – after a couple weeks – I began to feel better and it got easier. After a month, the bad symptoms went away all together. What benefits have I experienced since then? I have incredible, sustained energy all day long, even with no food. I am barely ever hungry anymore and could go all day without eating. I have suffered with terrible joint pain, in my knees and wrists especially, for most of my adult life, and I could not squat down to save my life. I have also had severe back pain for 20 years, and my doctor told me it is because of degenerative disc disease. All of this had me eating Ibuprofen like it was candy, and I was taking 8 per day for the past 7 years. Sometimes I literally felt like was 80 years old. On several occasions, my back pain was so bad that I would be unable to work for several weeks. I now experience 90% less pain overall, and I have not needed to take any Ibuprofen for 3 months. And I continue to feel better every day. I have carpal tunnel syndrome from the repetitive action of carrying heavy trays of food for years, and now my wrists no longer hurt. I can also do 25-30 squats without any discomfort in my knees. Prior to Zero Carb my blood press was 160/106 and when I check it recently, it was down to 142/88 which is definitely headed in the right direction. Once I am below 300 pounds, I am planning to get some blood work done to see where things stand. When I started my journey in December, I weighed in 380 pounds. Today, 3 months later, I weighed in at 311 pounds. That is a loss of 70 pounds in a little over 3 months! I went from a size 55 pants waist size down to a 46. I went from a size 3X – 4X shirt down to a size 1X – 2X. 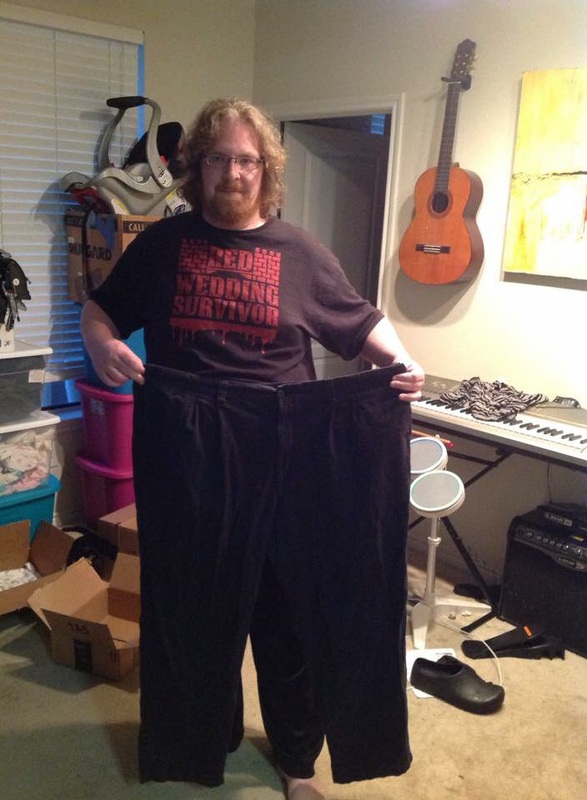 Adam today – April 2015 – holding a pair of his old 55 inch waist pants and 70 lbs lighter. I still have a long way to go to reach my goal weight of around 230 pounds (I’m 6’1″). But honestly, the weight is only part of why am eating this way now. I just love feeling energized and being almost pain-free. I am running around work like kids half my age, and I don’t have to chug energy drinks to do it! What do I eat? I eat mostly ribeye, ground beef, pork ribs, and chicken thighs. I eat eggs on occasion, but not every day. Once in a while I have a cup of coffee at work, but that is also not a daily thing. I rarely eat cheese because it makes me crave and I don’t want to get derailed. I only use spices if I am cooking for my wife, though I do use salt pretty regularly. I don’t add extra fat to my meat. The only beverage I drink is water. I eat when I’m hungry, and only when I’m hungry. I generally eat one meal per day and consume around 2 lbs of meat. I live my life, and I live it better than I have in a very long time. That’s about it I guess. That’s my journey so far! Thanks to all the people at Zeroing in on Health for being a wonderful source of zen wisdom and encouragement. And thanks to my wife Eisha for always standing beside me and helping me to succeed. I do this for you, as much as I do this for myself. Peace. This entry was posted in Testimonials and tagged Back Pain, Chronic Pain, Degenerative Disc Disease, Diet, Fat, Health, Joint Pain, Keto, Keto-Adapted, Ketogenic Diet, Ketosis, LCHF, Low Carb, Meat, Nutritional Ketosis, Pain, Paleo, Paleolithic, Primal, Weight Loss, Zero Carb by esmeelafleur. Bookmark the permalink. Thanks for sharing these wonderful testimonies. They are very interesting and helpful. Hurray for you! I know you must be as thrilled as I am to have discovered a way to live without food cravings and pain. Looking forward to hearing more of your progress. Congratulations! Wonderful , Inspiring story! God Bless you as you continue on this path! Very inspiring story. I’d love to see a follow up some day! So glad to hear your story. Very inspiring. I am just starting out on this journey but am already feeling better after just 1 week. No cravings here and I was busy today and didn’t have time to eat lunch or pack snacks before work but no problem, like you mentioned, i can go without eating so much better now when i need to. Thank you for sharing your experiences. So happy for you! I will be starting ZC on Sunday.. LIke to make contact with you.